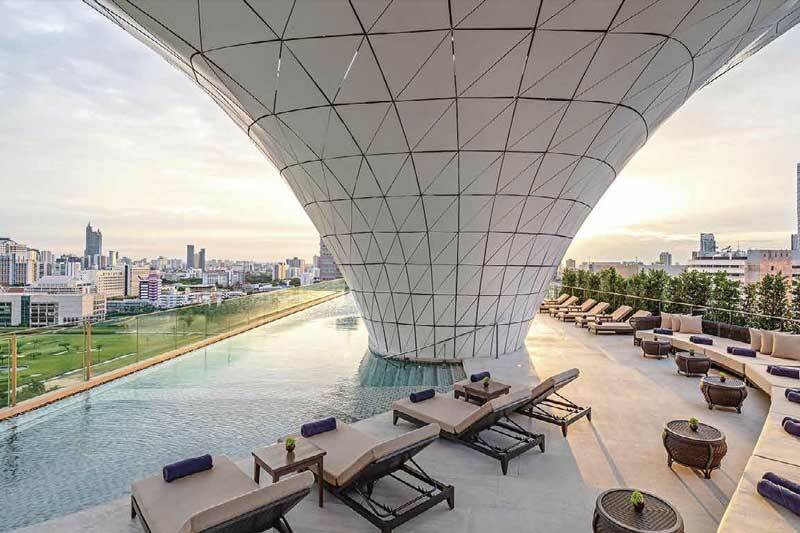 Bangkok continues to ascend the ranks of incredible luxury with new hotel offerings this year. The arrival of iconic luxury hotel Waldorf Astoria Bangkok, marks the latest property under the portfolio of Waldorf Astoria Hotels & Resorts, owned by the Hilton Group. The property strives to introduce its legacy of hospitality and style to the City of Angels as well as deliver once-in-a-lifetime experiences for guests. Located within the 60-storey Magnolias Ratchadamri Boulevard, the hotel is conveniently within walking distance to all the excitement that Bangkok has to offer. It boasts the most striking ballroom with its sweeping staircase and sophisticated ambience, making it a great venue for social events and weddings. Designed by architect André Fu and his AFSO studio which blends contemporary architecture together with Thai artisanal elements, the Waldorf Astoria Bangkok’s 171 guest rooms and suites are the marvel of the chain’s legendary luxury adapted to a local yet contemporary setting. Waldorf Astoria Bangkok is also set to become a dining destination, with 3 unique restaurants including Nordic-Thai Cuisine at Front Room, a lounge and 2 bars to fulfil everyone’s culinary desires.